The NEW FALL SEASON on The AIR Starts Today! 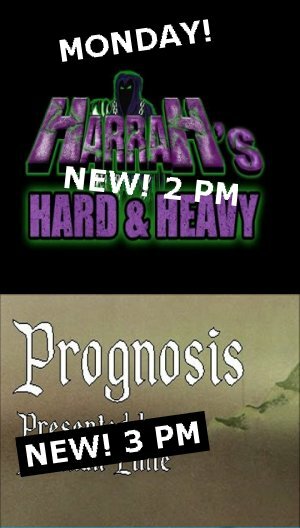 Kicking off a week of premieres that will see new episodes of every one of our late-afternoon music programs, we are thrilled to offer up bright, shiny, new editions of Harrah’s Hard & Heavy and Prognosis. At 2 PM, Lee Harrah returns with his first new episode of Harrah’s Hard & Heavy in 2017. It’s been a rough year for Lee, with the passing of his mother in January, and it’s great to have him back in the saddle for HHH and also for Word Association with Lee & Rudy, which returns with a new show Wednesday. This week Lee introduces part one of a two-part special that brings you live performances by Iron Maiden. If you know Lee, you know that this is his favorite Metal band. If you don’t know Lee, you will learn that fact. At 3 PM we have our first new episode of Prognosis in months. Haversham Recording Institute in London, where this and some of our other shows originate, has been swamped with work, due in large part to their being pressed into service for international news organizations in the wake of the terror attacks in the UK. Now they are ready to return, but Prognosis host, Herman Linte, was still working on what we politely call “paying gigs,” so for one week only Prognosis will be presented by Nigel Pye, who is familiar to listeners of The AIR from his Psychedlic Shack series. Since Psychedelic Shack is still being retooled to fit into a new one-hour format, Nigel decided to step behind Herman’s microphone this week to present classic albjms from two bands that qualify as both Psychedlic and Progessive Rock, Tomorrow (featuring a pre-YES Steve Howe) and The Nice (featuring a pre-ELP Keith Emerson). This is a powerfully cool show. We are assured that Mr. Linte will return next week. At 5 PM today we are expecting a new episode of Marking Out, covering the world of professional wrestling with BelVillain and Betty. This show originates out of WMUL in Huntington. At 6 PM The New Music Show will add several new tunes to the mix, including tracks from Byzantine, The Heavy Editors, Bobaflex, Todd Rundgren, The Foo Fighters and more. Our evening talk line-up will remain in rerun mode for a couple more weeks, before we shake things up and move things around. Tuesday should bring new episodes of Radio Free Charleston, Ska Madness and The Swing Shift. Wednesday we expect new episodes of Life Speaks to Michele Zirkle, Beatles Blast, Curtain Call, Woord Association with Lee & Rudy and The Comedy Vault. Thursday will see a new edition of Radio Free Charleston International. Friday we expect to bring you new installments of Radio Coolsville, Sydney’s Big Electric Cat and The Third Shift. It’s an exciting time to be alive, if for no other reason than you can listen to new episodes of your favorite shows on The AIR!